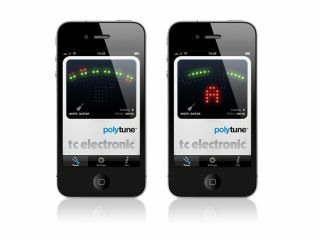 As of today TC-Electronic has released a version 1.1 update to its excellent PolyTune iOS app. The app, which is based on TC's PolyTune hardware, allows users to turn their iPhone, iPad or iPod touch into a tuner that will tune all the strings of a guitar with a single strum, thanks to its polyphonic functionality. The update, which is free to current users, makes the app compatible with iPhone 4 and the iOS 4 operating system. It also introduces a feature that allows users to switch the red/green colour scheme to yellow/blue. More exciting, however, is the news that TC has lowered the price of the app to just £0.59 for the next three days (until midnight December 19). After the three day period the app's regular price, previously £5.99, will drop to £2.99. What more persuasion do you need?